Woody Allen has filed a $68 million lawsuit against Amazon Studios, which says that Amazon breached its contract by refusing to distribute his most recent film, and terminating a four-picture production and distribution deal without cause. The lawsuit, which was filed Thursday in the Southern District of New York by Gravier Productions and Allen, claims that Amazon backed out to distribute his film, “A Rainy Day in New York,” in June after accusations resurfaced that he sexually molested his adopted daughter, Dylan Farrow, in August 1992. Allen has repeatedly denied the accusations and in the lawsuit calls them “baseless.” He now seeks $68 million in damages. “Amazon has tried to excuse its action by referencing a 25-year-old baseless allegation against Mr. Allen, but that allegation was already well-known to Amazon (and the public) before Amazon entered into four separate deals with Mr. Allen–and in any event, it does not provide a basis for Amazon to terminate the contract. There simply was no legitimate ground for Amazon to renege on its promises,” the suit reads. A representative for Amazon did not immediately respond to TheWrap’s comment. The lawsuit says that his relationship with Amazon began to falter after Roy Price resigned as president of Amazon Studios following a sexual harassment scandal. Allen says that Amazon reached out to his representatives in December 2017 to discuss the negative publicity and “reputation harm” that had come because of Price, and its association with Harvey Weinstein and his own sexual assault scandal. At that time, it had agreed to push the release of “A Rainy Day in New York” from 2018 to 2019. At the time, the film had not yet been completed. “Defendants’ counsel merely made the vague statement that Amazon Content’s performance of the MAA became ‘impracticable’ because of ‘supervening events, including renewed allegations against Mr. Allen, his own controversial comments, and the increasing refusal of top talent to work with him or be associated with him in any way, all of which have frustrated the purpose of the agreement,” the lawsuit reads. It then said that Allen repeatedly asked what they meant by “renewed allegations” and Amazon did not respond. Diane Keaton scored her first, and so far only, Best Actress Oscar for the title role of "Annie Hall." The movie won four Oscars overall; the actress has since been nominated for three roles with other directors. Mariel Hemingway played the role of Allen's teen lover in "Manahattan," earning her an Oscar nomination for Best Supporting Actress. Hemingway was only 16 at the time of filming. Penelope Cruz won a Best Supporting Actress Oscar for her role as the unstable former wife of Javier Bardem's Juan Antonio in "Vicky Cristina Barcelona." Michael Caine won his first Oscar for his work in "Hannah and Her Sisters"; co-star Dianne Wiest won the first of her two Oscars in this film. Sean Penn received his second Best Actor nomination from playing a jazz guitarist on "Sweet and Lowdown." Penn's costar in "Sweet and Lowdown," Samantha Morton, earned her first Oscar nomination for playing a mute woman. Dianne Wiest won two Oscars under Woody Allen's direction, both supporting actress roles, in "Hannah and Her Sisters" and "Bullets Over Broadway." Mira Sorvino's only Oscar nomination and win came from her role in "Mighty Aphrodite." His work on "Crimes and Misdeamnors" nabbed Martin Landau a second Best Supporting Actor Oscar nomination. Jennifer Tilly became a Best Supporting Actress Oscar nominee from playing a talentless actress on "Bullets Over Broadway." Another "Bullets Over Broadway" actor, Chazz Palminteri was nominated for Best Supporting Actor. 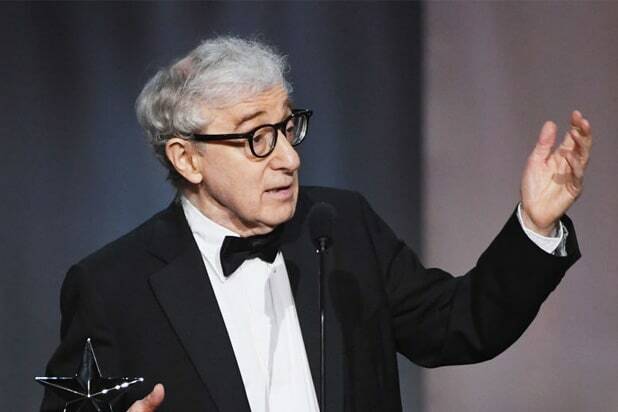 "Husbands and Wives" took two Academy Award nominations: one for Woody Allen's original screenplay and the other for Judy Davis's work as a supporting actress. Geraldine Page was nominated for eight Oscars, the sixth of which for her work in "Interiors." Playing the second wife to Page's first gave Maureen Stapleton her third Oscar nomination; she went on to win for her work as an activist in "Reds."